In a summer when much of the focus of the beverage industry has been on the Pepsico move to buy its distribution systen, PEP showed that it still had its eyes on the future with the acquisition of Amacoco. While the acquisition is dressed up as a move with international motivations, its is likely that PEP has also got a eye on the US with the move. In recent months media coverage of coconut water has increased, and the three current players in the US market (Zico, Vita Coco and ONE) have been in an distribution expansion for the entire year. I personally like coconut water: Great original taste, nice unique packaging... Its ready for primetime: Now the question is - who will be the winner?? The Summer of 2009 is Over. Now What? This has been a good summer for the traditional beverage powerhouses. While the recession economy has driven consumers to cheaper refreshment alternatives (ie CSDs) to boost consumer demand, everyone has benefited from the price increases of 2008 and the fall in input costs in 2009. As a result volumes may have been soft, but revenues and profits are up. As a bottler friend of mine observed, "This is the best summer for years. pricing is up, costs are down - I am profitable on every case that I sell". Even the softness in bottled water is a reason for the big guys to celebrate. Bottled water has been a low margin, high volume distraction for a decade... the summer of 2009 has weakened a strong competitor (Nestle) and decreased retailer clout. So all is well in the beverage world? Well, probably not. It is now apparent that the traditional consumer marketing of commodity CSDs appears to be failing (see the failings of Pepsi for illustrations). Underlying consumer interest in more healthful, more functional alternatives is still there: Attractive products in Energy, Sports, Enhanced Waters, and Functional Beverages are still making progress. So, coming into the planning phase for 2010 what will be on people's minds? - How quickly will Pepsico close the deal with their bottlers and what will the fallout be? - Is bottled water at its maximum? Or is there more growth there? - If input costs go up as the economy reflates, how much margin can the businesses keep? - Can the businesses continue to cut overhead and marketing with no fallout? - Coconut water is now front and center in the new beverage agenda (after Pepsi's purchase of Amacoco) - will it grow to scale? Who will the winner be? - Can Gatorade evolve? Its single use positioning is no longer enough to sustain its 80 share. - How quickly will energy resume its growth? And will shots continue to complicate the category? 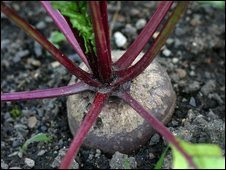 Now there is scholarship on the humble beetroot, claiming that beetroot juice can increase the drinker's stamina by 16%. It is fascination how we still are finding new perspectives on the foods we consume.